Turn on the TV during any Saturday or Sunday in the fall and what do you see? Chances are it’s a football game being played on a synthetic turf field. Artificial turf is used everywhere now from professional, college and high school athletics to daycare play areas. It has become obvious why many of the newest indoor professional stadiums have artificial turf, but why are so many others choosing this option? New synthetic turf fields offer improved safety, consistent playability, and a wonderful appearance for both the athlete and observer. 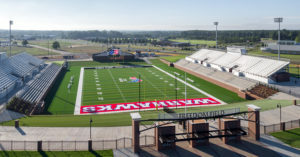 With today’s high demand on field performance, a facility that once had difficulty keeping natural grass in a usable condition might now have a new synthetic field that they can be proud of and use in virtually any condition for a multitude of functions. There are thousands of synthetic turf sports fields in the U.S., and according to the Synthetic Turf Council, the number increases every year with between 1,200 to 1,500 new fields being installed. What sports are using synthetic turf besides football? It may be easier to answer what sports are not using synthetic turf playfields. Besides the obvious football and soccer, artificial turf is utilized by other sports such as lacrosse, field hockey, rugby, tennis and even baseball and softball. It’s not just professional and college sports that are making the switch. With the popularity of sports of all kinds with children, teens and their parents, synthetic fields are everywhere, not only used by schools of all sizes but by small-town parks as well. It’s also becoming more common to see it used in landscaping, especially in those high traffic areas where grass just won’t grow or might be near impossible to maintain. 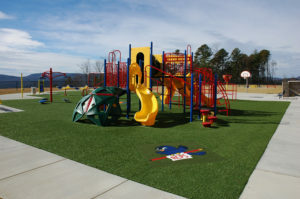 We see more and more playgrounds using the landscape synthetic turf as well as pet specific areas. Preschools and daycares are choosing artificial turf simply because it never needs mowing and produces no mess. Are you a golfer? It’s becoming more popular and financially doable to have a small putting green at home now with the use of synthetic turfs. Is artificial turf something you have been considering, but have heard the negative news reports about the rubber infill? Well, there are number of alternative infill profiles from recycled tennis shoes to organics such as coconut and rice husks. Over the years, Southern A&E, LLC has had the opportunity to work with many clients to help them make the best choice for their synthetic and natural grass fields. If you want to learn more about your options and the costs associated with either building that new field or switching out your natural grass field to one of the newest technologies in synthetic turf, we are always ready to assist.